The rather complex nature of the nuclear forces generates a broad range and diversity of phenomena that can be observed. 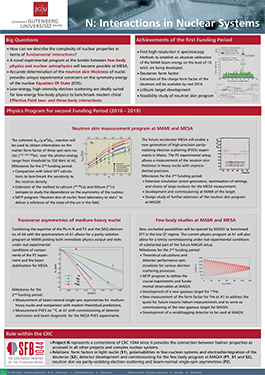 Recent developments in Effective Field Theory (EFT) for nuclear forces enable controlled calculations of matter at nuclear densities, providing for the first time access to accurate nucleon-nucleon (NN) and three-nucleon (3N) forces. This advance has opened up a new era in the study of strongly interacting nuclear matter. However, these theoretical approaches need guidance from experiment. Project N is dedicated to the study of these strongly interacting systems on a large variety of scales. On one side the project aims at an accurate determination of the neutron skin thickness of nuclei, which will provide a unique experimental constraint on the symmetry energy of the nuclear Equation Of State (EOS). On the other side, thanks to the new experimental possibilities at MESA, it addresses the interactions in few-baryon systems in high-precision low-energy electron scattering.